Tag Archives for " positive birth stories "
Guest Post: How to transform your birth experience from the inside out, by Dr. Gulara Vincent. 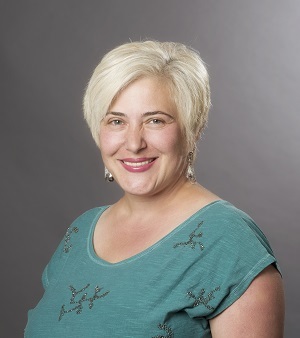 Today I welcome writer and law lecturer Dr Gulara Vincent to the BirthEssence Blog with a guest post about how completing unfinished business helped her transform her birth experience. ‘Unfinished business’ from the past can block your dreams. I learnt this lesson the hard-way through childbirth, and here’s how my journey began. In November 2012, I was attending a Journey reunion in Birmingham. I was really into the Journey, a method of cellular healing developed by Brandon Bays, and these meetings gave me an opportunity to meet other people who knew this method too. We took turns to swap and give each other some free support. Each meeting had a practitioner who told us about their Journey path: what brought them here and how the Journey transformed their lives. As I sat on a chair listening to the speaker that day, I stroked my belly feeling slight movements of my baby. I was 18 weeks pregnant with a long-awaited baby. The speaker’s voice soothed me, and watching her face framed with long dark hair, I softened in response. That speaker was Charlotte Kanyi. I am not going to recount her story here because it’s hers to tell, but it touched me so much that I approached her during the break and started talking about her business. I had seen her business cards on the stalls during every re-union, and even took it home on one or two occasions, but never dared to speak to her before. ‘I have some anxiety around childbirth,’ I said. By then I’d been attending workshops in Stroud to do some ‘birth works’, a process which explored our own birth experience and also explained how birth impacts the child. It was in one of those workshops that the facilitator explained that women who have past sexual trauma may struggle giving birth naturally. The cells remember the invasion and may clamp up in response to the pain caused by a child trying to exit. To me, this was not the time to deal with past sexual trauma. My focus was on delivering my baby into the world, not dwelling on painful memories. It was better left untouched for now, I told myself, even though deep down I was still worried that past trauma can impact my chances of giving birth as naturally as possible. ‘I’d like to have a session before I give birth,’ I said to Charlotte tentatively. ‘If there’s anxiety, it’s best to clear it sooner than later. You don’t want to carry it throughout your pregnancy because the baby is aware of it too,’ she said. Her words made sense, but I didn’t follow her advice on that day. Soon enough though, life presented me with plenty more worries. I was classed as ‘high risk’ and a consultant at the Women’s Hospital saw me every two weeks. Each time, he looked for what was wrong. And of course, if you look hard enough, there’s always something to find. The idea of tubes being passed through the nose of my new-born baby was so distressing that I found Charlotte’s card and gave her a call. A few days later, I was sitting on a couch in her front room shaking uncontrollably as an avalanche of memories overwhelmed me. By the end of the session, I felt calmer and more at peace. Miraculously, the next time I saw the consultant, he said that the liquid levels around the baby were normal and there was no need for intervention. I started seeing Charlotte regularly. Life kept throwing at me opportunities for distress growth. 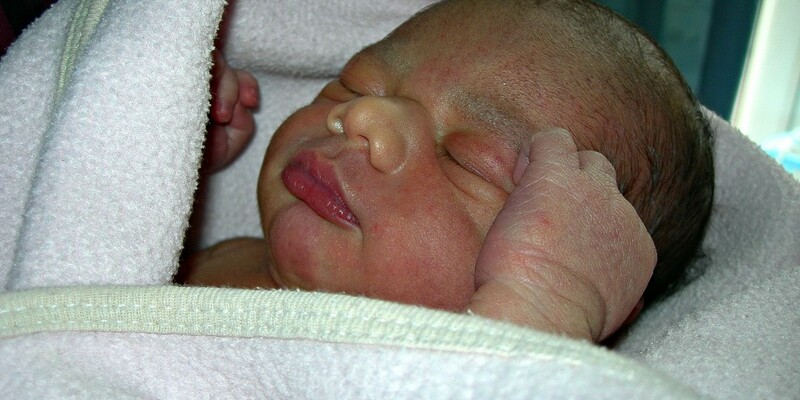 I was severely traumatised by the intervention of midwives during the induction, and the emergency C-section left me reeling with disappointment. I cried for days after the birth, and all the stress and tension culminated in two painful episodes of mastitis. I worried about everything all the time. The more I worked with Charlotte, the lighter I felt. A little over a year later, I was pregnant again. This time, I had no second thoughts about diving in at the deep end to clear any ‘unfinished business’ which could impact my pregnancy and delivery. We worked to clear my past sexual trauma; the trauma caused by my son’s birth; fears around speaking up and standing up for myself when I was at the Women’s Hospital – the list went on and on. I remember vividly the first time Charlotte suggested that I could refuse to follow medical advice and even have a homebirth. Horrified at the idea, I gawked at her ready to run for my life. It took one session to clear that fear, and I came to realise that a home birth was the best option for me. I hired a doula and the home birth team at the Women’s Hospital transformed my experience of the last pregnancy and childbirth – there were no invasive scans with consultants looking for faults. Instead, there was a team of gentle loving women who saw natural birth after C-section as absolutely normal and even desirable. I felt like I had a personal cheering squad and their love and support were healing and nourishing. When the big day arrived and I went into labour on the due date, I had a birthing pool in my front room. The birth team came to support me and my husband was there to hold me in the water. My labour was beautiful, almost ecstatic, and although I ended up having another emergency C-section, the birth experience itself was at the opposite end of the spectrum to my son’s birth; I was calm, confident, supported and in control. In short, I’m living testament that when we shed off our emotional baggage, our experiences transform. Childbirth is no exception. Dr Gulara Vincent is a writer, university law lecturer and a Momentum Mentor for Writers. When not writing or teaching, she helps women writers to release their inner fears and emotional blocks so that they can have a successful writing career. You can connect with her at www.gularavincent.com, visit her facebook page or Twitter account @gulara_vincent. Healing Birth Trauma: Reflections on the meaning of my different birth stories. 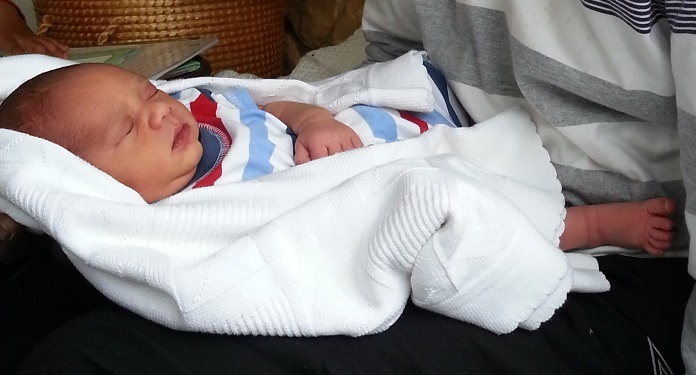 My second son Idrisa at three days old. 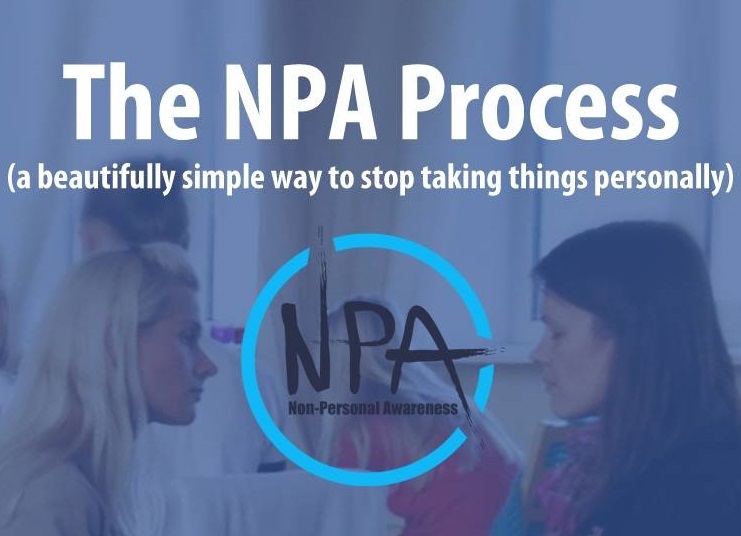 This post was first published on 27th July 2015 as a submission for The Birth Story Project where you can still read it and many other inspiring stories. Both my sons were born at home. Calm, Serene and blissful; my first son was born still sleeping into a pool and gave a gentle sigh for his first breath, to a delighted audience of four, myself, my husband and two lovely midwives. Loud, raucous and exhilarating; my second was born in a hurry on the floor of my shower, crying on arrival for his first breath, to a delighted audience of one, me. I began to wonder about these hugely contrasting experiences in a similar starting environment. Was it simply their different personalities shaping the way they came into the world? Their birth, their chosen start to life and me a willing co-creative partner. Certainly each entrance was a perfect fit for what each of my children needed and desired to experience. Still, I felt there was more, I felt that there was also a message for me. What I wondered was my side of the bargain? What was the gift for me in their birth stories? Rewind to my own entrance into the world. A stark contrast, according to baby me's perception. Born breech, with my mum in the unfortunately all too common recumbent beetle position, pushing against gravity was never going to be easy. 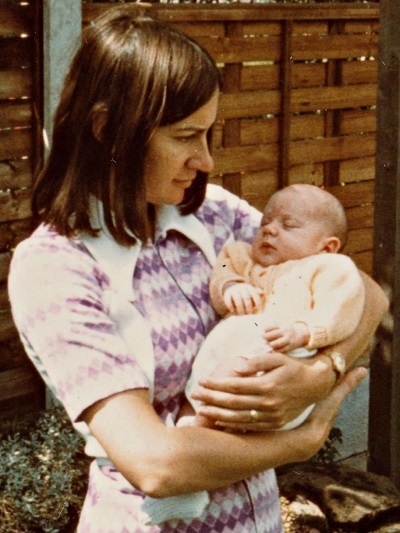 My mum and me, we did brilliantly, right until the end when my stuck head needed to be eased out with forceps and I was immediately whisked off to a temporary abode by a sunny window in an incubator. Me, with my mum, one month old. I constructed my version of reality around an unfriendly universe, separation, and abandonment. Stripped of my power and any say in what happened to me, I felt truly worthless, unheard and unseen. I doubted my ability to complete any task by myself. Of course this was only a short blip in a happy, loving environment. But my expectations were set: Life is hard, People take over against your will, maybe you couldn't have done it anyway. Better not try. As an adult I have been gradually unpicking, unravelling and replacing this subconscious programming. 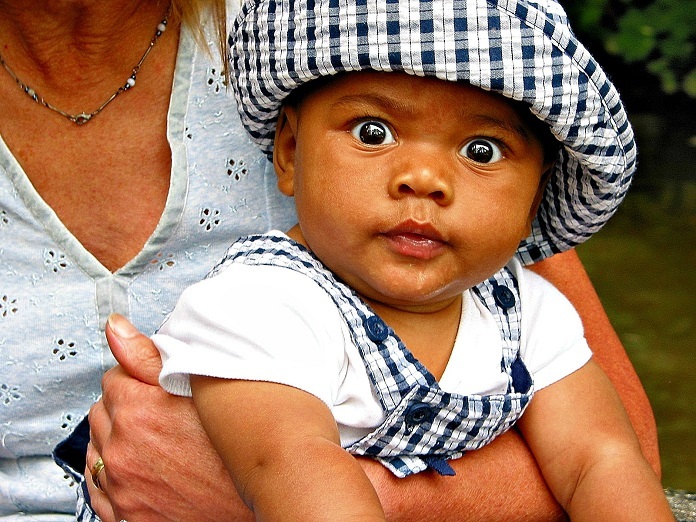 As free as I became, on the approach to my second son's birth I felt my foundations shaking. I was terrified. I didn't know if I could do it. It didn't matter that I knew consciously that women are made for birth, that it is an entirely natural physiological function performed without drama by every other mammal in the animal kingdom. Or even that I had already done it once. There remained a persistent doubt. Hold on a minute I hear you question? You've skipped to your second? Shouldn't the terror have come up with the first? Well it did to a point. But as I have discovered the universe is pretty friendly, especially when you ask for help. During my first pregnancy fears surfaced and were released. I dug deep and cleared out all the blocks and conditioning I could find. I felt confident. I was rewarded by a delightful birth experience. I was on top of the world. I had done it! So why the extreme terror during my second pregnancy? The answer was revealed to me in my ongoing growth and transformation as a confident woman that threads through my adult life and two birth stories. My first birth experience was my first opportunity to really embody confidence deeply into my cells. The first visceral, lived in the body proof that I was not worthless and a failure as a woman. That actually I was an amazing and powerful woman. However, having achieved one birth with assistance, (albeit rather hands off assistance, limited to one respectful and consented to vaginal examination and two giggling midwifes lit up by their head torch peering through the ripples of the pool to tell me of my progress.) I still didn't know if I could do anything on my own. Step two along the path was learning that I could. And I needed a different experience to fulfil that. One I could not foresee or second guess. My second son's birth perfectly met that need and put paid to the remnants of lingering doubt of capabilities as a woman. "I want the pool and there is no pool" I roared. Dimly aware that trotting off to move furniture and make space for the pool was no longer the best use of my husband's loving support at that moment, I was already too far gone for ordinary communication. But that roar of frustration released my agenda for the pool and something else took over. I knew and finally admitted to myself what my husband was as yet sweetly unaware. This baby was coming right now. I retreated to the shower with a vague thought; warm water, nice. All my focus and energy was on the task at hand. Just me and my baby, cocooned in the shower cubicle and all else ceased to exist. I was no longer focused outwards, checking externally if what I was doing was correct. I was no longer handing over responsibility blindly to someone I perceived as more qualified and competent than me. Failure wasn't an option. Of course I was not thinking in these terms. I was barely even thinking at all in fact. I was living my experience of birth in communion with my son. And in the crucial final stages I did it alone. The imprint of disempowerment exploded against my shower floor as my baby was born in a sudden whoosh of amniotic fluid. I brought him smoothly round through my legs and sat down laughing in total euphoria at the enormity of the moment and at the expression on my husband's surprised face as he came running to my summons. I did it alone. No assistance needed. Nothing. There is still a delighted young girl skipping around inside me going, "Look, look everyone, look at what I did, you didn't know I could do that, did you?" and, "See, see," she says to the doctors who helped me be born, "I can do it after all." My next step on the road? Well I don't know if there will be a third child or not, but I do know that my exploration of personal confidence is leading me to a place where I am so confident that even though I know I can do it alone, I no longer need to. That place is filled with laughing women in community and support, and in that place I am truly home. 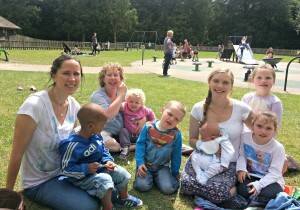 Positive Birth Meet Up in Sutton Coldfield: Sharing positive pregnancy and birth stories in the sun. Discussing everything from massage as pain relief for birth through the challenges of working in pregnancy and how to rest with restless children to entertain the Positive Birth Movement North Birmingham decamped to Sutton Park in Sutton Coldfield to inspire and support each other with positivity around birth. In this article I provide some background about the growing Positive Birth Movement and how you may get involved. The story of the birth of their children is often the one memory that stays vivid until the end of a woman’s life. These birth stories matter so much to women and need to be told. At the same time the stories most often shared via media are drama fuelled and often less than positive. Fear is sticky. Misinformation from televised dramas can be sticky too. How many people instantly think of a woman on her back screaming for mercy when they think of birth? Far too many I would hazard a guess. Yet this is far from the reality of how birth happens and from how it can be, Yet still, all too often people gather and share horror stories about what went wrong with their next door neighbour’s sister in law. As a pregnant woman it can be hard to avoid this kind of unintended reinforcement of negativity. It is an example of just what you do not need more of in pregnancy when emotions often run high skipping along with the pregnancy hormones. But where to go when you want to air your hopes and dreams in an atmosphere of encouragement and support without being regaled with the latest cautionary tale? In steps the Positive Birth Movement and its rapidly swelling numbers of Free Positive Birth Groups. The movement aims to challenge and change the epidemic of negativity around childbirth and groups meet monthly all around the world to encourage the spread of positivity and support and empower women to approach birth differently. Following the birth of my first son I began to realise that it was not so common to reply with positive delight and a big grin when describing labour. A strong desire arose to make a difference to other women and support them to enjoy their birth experience. As part of this mission I set up the Positive Birth Movement North Birmingham Group. Usually run from my home in Erdington we decided to take a leap of faith with the weather and opted for the park this month. It was a great option. 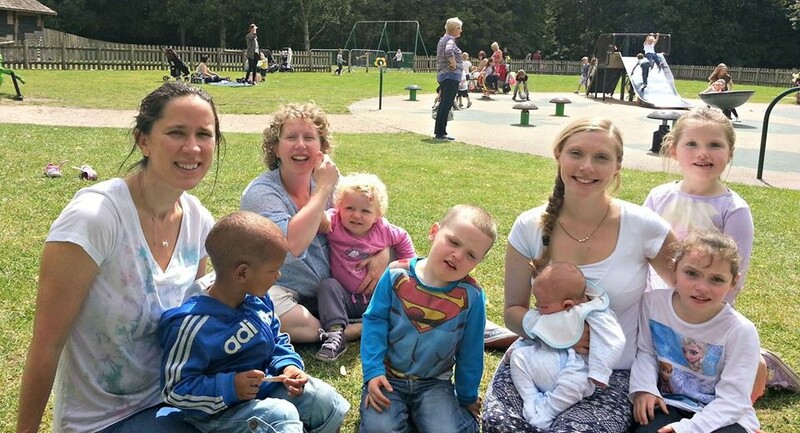 The British Summer might be a bit hit and miss at times but it was kind to us as we took the Positive Birth Movement North Birmingham out to play in the park. Letting the children run wild round the playground as we got on with the serious business of three hours of nattering and laughing was the perfect solution to the childcare dilemma in the summer holidays. Both children and women had a fantastic time. We started with the theme of the month : Pain and let the discussion unfold from there. We were so lucky this month to have Kim come along. With her gentle candid honesty and inspiring passion for birth she shared elements of the birth stories of her four children. It was equally inspiring to hear about her volunteer work as a Doula with Bethel Doulas, supporting vulnerable women many of them asylum seekers on their journey to motherhood. With the biscuits demolished, chips and ice-creams following, still we were all reluctant to leave… All in all it was a great morning and we are planning the next one for early September, hoping for equally favourable weather for a picnic. If you are local to Birmingham, and interested in Positive Birth do check out the links below and come along. We will be delighted to see you there. If you live further afield there is probably a group local to you. Check out the listings on the main page and support this wonderful venture. For more information about the Positive Birth Movement and to find your local group click here or see their facebook page or join them on Twitter. To follow the Positive Birth Movement North Birmingham Group and come along to our group click here. I love Christmas time and especially the family festivities and sharing of gifts. It is a time that really warms my heart. This year my heart is warmed and positively thrilled to bits with one of my Christmas presents to myself: the new book edited by Milli Hill just published called Water Birth: Stories to inspire and inform . I am ever so excited because the birth of my first child is one of the featured stories. To celebrate my first published piece of writing I have written a post about my personal experience of water birth including some of the details of the birth story that is found in full in the book. I do hope you enjoy reading. I have always loved water. Holidaying in France as a young child I learnt to swim with the help of my mum in the shallows of a serene lake. I remember feeling so proud, brave and free as I let my feet lift off the sand and float and began to move through the water unaided. Growing up many happy days were spent playing with my brother and friends in rivers and oceans. We would leap and dive under crashing waves in Wales, daring the surf to catch us as we ran away. We would shout with raucous laughter, racing, chasing and splashing. We would spend hours making damns, creating pools to soak in. We would alternate pushing against the rivers’ currents with allowing ourselves to be carried tranquilly downstream to the sound of accompanying birdsong. As an adult I am still instantly soothed and relaxed by the trickling sound of a river meandering along its path and the regular rhythm of crashing surf followed by its gentle tinkling return through shells and shingle. When I became pregnant with my first child in 2009 and was introduced to the possibility of water birth it seemed an obvious choice. 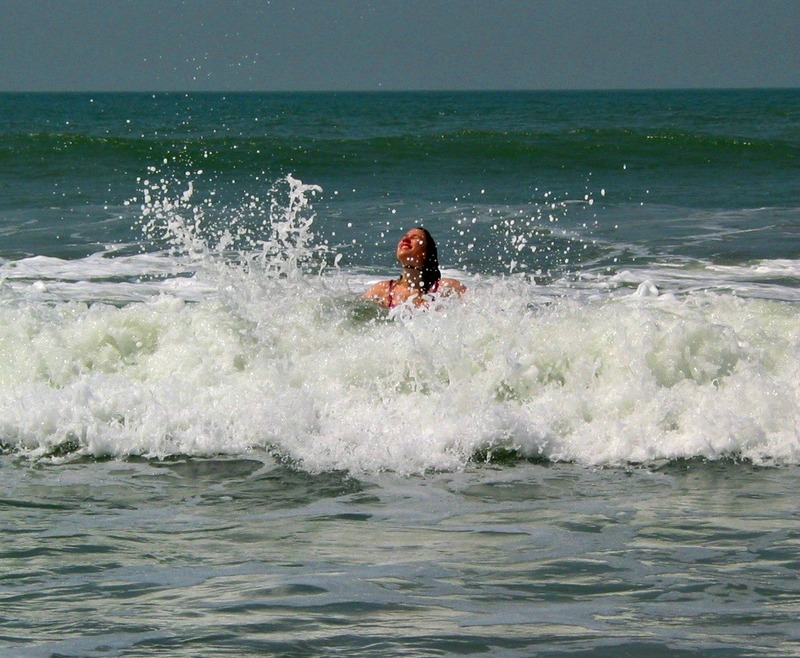 I continued to swim regularly throughout this pregnancy, getting a taste of how I might feel during a water birth. 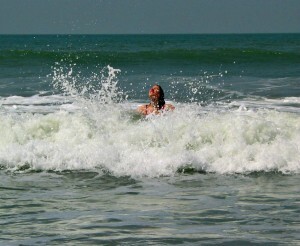 I enjoyed the weightlessness and ease of movement in the water. I even enjoyed the contrast as I climbed back out onto land, the sudden heaviness pulling me down into the earth, solid and stable beneath my feet. I appreciated the strong grounded feeling with a secret inner glee at the delightful memory of the floating freedom, a sense of power and possibility and the connection with my baby, whom I sensed enjoyed these sensations as much as I did. I read avidly about birth and particularly water birth, keen to learn everything I could before my turn came. My reading revealed fascinating history and surprising facts and ultimately allayed any concerns I may have had over safety. I read of petroglyphs in Egypt depicting births of Pharaohs approximately 8000 years ago and accounts from the oral traditions of indigenous people who gave birth in shallow sea water or pools. There are examples both old and in modern day times right across the globe, from the Maoris to the Indians of Central America to the Hawaiian islands. These are glorious tales of women supporting women using the warm water to aid relaxation and for pain relief, that really warmed my heart. In the Western world documented water birth is much more recent and until the latter part of the last century very sporadic. Water birth remained largely unknown until the 1970’s and the pioneering work of two obstetricians, Michel Odent in France and Igor Tjarkovsky in Russia. Igor’s initial interest in water was sparked by a desire to help his premature daughter by immersing her in warm water in order to create an environment akin to the womb that she’d departed two months early. Seeing her rapid progress he went onto develop glass tanks and to experiment with the use of water during childbirth itself. Michel Odent set up a Birthing Centre in Pithviers which focused on creating a home like environment with minimal intervention. The birthing rooms included baths for relaxation and pain relief. Inevitably as women enjoyed the benefits of the soothing warm water some women didn’t want to get out again and babies started to be born in the water. By 1983 he had attended over 100 of these water births and was able to publish a medical research paper. From here on in the popularity of water birth blossomed and bloomed. Supportive studies were published demonstrating the safety, women and midwives were vocal supporters and the opportunity to experience a water birth became more accessible and common as word spread. Today most maternity units in the UK are able to offer water birth to their women. As I read and learnt more about the sense of privacy and safety that labouring in a pool could give you, it sounded divine. I was also inspired by positive stories on the internet and the birth of a friend’s baby, nearly 10lbs in water with ease and grace and no tearing. I bit the bullet and bought my own pool that took up the whole of my living room. But, eventually my turn came. 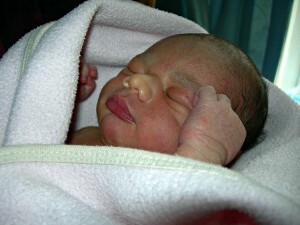 In my living room, gently into the dark waters of my birth pool, my baby boy was born. The atmosphere was serene and still, apart from some urgent clamouring from the midwives to get my husband back in the room before he missed it! He shot out across the pool like a shooting star across the night sky. His body, dimly lit by the head torch carried by the midwife, could be seen curled and glistening through the ripples caused by my undulating body as it arced into position. Lifted out by myself and my husband together in calm tranquillity, he appeared to be still sleep. The only noise was his sudden, surprising intake of breath followed by a deep satisfied sigh of happiness as he nestled against my chest, legs still floating in the water. This delightful book is a compilation of women’s birth stories covering a wide range of situations – hospital, home, birthcentre, twins… All with the use of water. All the stories are intended, as the title implies, to inspire and inform of the wonderful possibilities of using water in childbirth. It is packed full of information within the stories themselves and in the commentary by Milli Hill who has herself experienced the delights of water birth and whose story also features. It is my hope that women reading these stories are uplifted and guided into their own power to choose and create their own positive and transformative birth experience. I hope you have enjoyed reading this and would love to hear from you in the comments below. The definitive book on water birth and the source of the historical data quoted is called The Waterbirth Book and is by Janet Balaskas.